Address: Rosehill, Deer Park Road, Barnstaple, EX32 0PD. 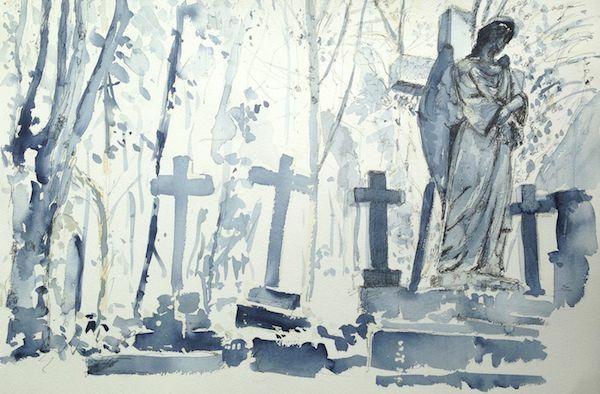 Originally from the north east of England, Helen has spent the last 30 years living in London where she has been working as a watercolourist. She is mainly self-taught but has attended many courses to develop her practice. She has recently relocated to north Devon and has found the area very inspiring. She often includes an architectural component in her work using line and wash. The line to structure the image and loose brushmarks to give an impression of what she sees. She has also been developing works in print and will show a selection of these. Rosehill is to be found in Deer Park Road opposite the North Devon Hospice. Open; 23rd & 24th May, 28th May, 30th & 31st May, 4th June, 6th & 7th June. Please note that this venue is indicated in error as number 36 on the map in the printed brochure, however the location is correct.